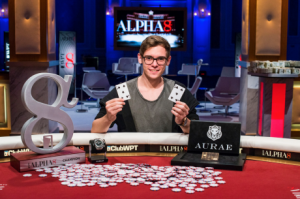 Fedor Holz of Germany has won the WPT Alpha8 poker title played at Bellagio in Las Vegas. He is the final table winner of the massive $100,000 buy in world poker tour Alpha8 poker championship Held in Las Vegas. The event had total 45 entries to which Holz topped the field and became the champion of the prestigious title. 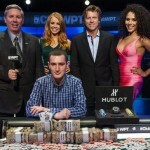 He collected the first prize and took home a whooping cash of $1,589,219. Holz also got an Oceanographic 4000, watch by Hublot and a MasterCard which had $10,000 of funds. This is one of the biggest buy in title and the largest cash win by Holz where he made more than $1.5 million of cash. The total earning for Fedor Holz now crossed to $3.8 million. The game started with 8 players remaining in the field where Holz had about 40% of the total chip with him. Out of total 7 top position holders and guaranteed prize winners were from the United States of America (5), Germany (one) and Canada (One). The first elimination from the event was of David Peters, another US poker pro. He got eliminated when the game started and placed for 8th place. After Peters elimination, Holz kept his accumulation of chips without any problem and showdown. Nick Petrangelo of USA and Daniel Negreanu of Canada were booked for the second and third place consecutively.Holz was very happy to collected the first prize and becoming the champion of WPT Alpha8 at Bellagio. Total Career title for Holz is now increased to 3 and total cashes for him is 31.
get every poker details at here only i.e best poker sites and play the most entertaining game in the world.